Shivsunder, a columnist for Gauri Lankesh's Lankesh Patrike, on the journalist's murder. There were no immediate death threats to her in the sense that somebody would murder her, but there was a continuous heated exchange of words between her and goons. There were the usual threats and intimidation from right wing goons in Karnataka, but there was no particular threat. Three months ago, when the annual issue of Lankesh Patrike, the weekly which Gauri edited, was being celebrated, Yogesh, one of the magazine's columnists, was assaulted when he went out for a cup of tea. Maybe they wanted to target Gauri that day, but since Yogesh went out for tea instead of Gauri, they must have decided to send a message across to Gauri by attacking Yogesh. Since 2005, Gauri has been continuously exposing the wrongdoings and hate campaigns of the right wing for which she finally paid the price. For the last 15 years she has been facing many defamation cases. When she could not attend court after repeated reminders she was taken into custody for an hour in the court premises and given bail. There has been continuous danger to her life ever since she began writing against the right wing. I can't remember a single day when she was not verbally abused or targetted on Twitter and other social media. They are now brazenly, shamelessly, celebrating her murder. One rightwing organisation posted: 'One goon of India has been killed, let us celebrate. One criminal has been killed, let us celebrate'. Right wing groups are celebrating Gauri's murder on Facebook. I spoke to Gauri the day before (her murder on September 5). We discussed the special Deepavali issue of Lankesh Patrike. She wanted me to contribute a column and we discussed the subject. Lankesh Patrike would hit the stands on Wednesdays and we regularly discussed the contents and cover stories. Earlier, they used to give hints and then kill; now they have started killing without any hints. Gauri, one of the vocal liberal voices, has been silenced forever. We demand a special investigation team under judicial supervision to investigate Gauri's murder. 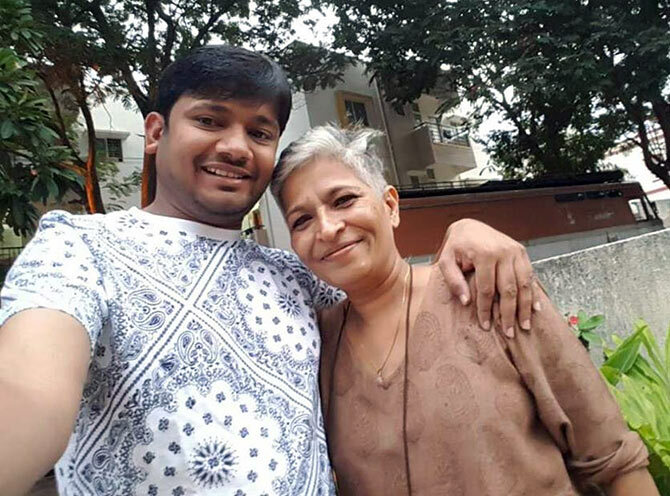 IMAGE: Gauri Lankesh with Kanhaiya Kumar, the Jawaharlal Nehru University student leader, who she considered a son.